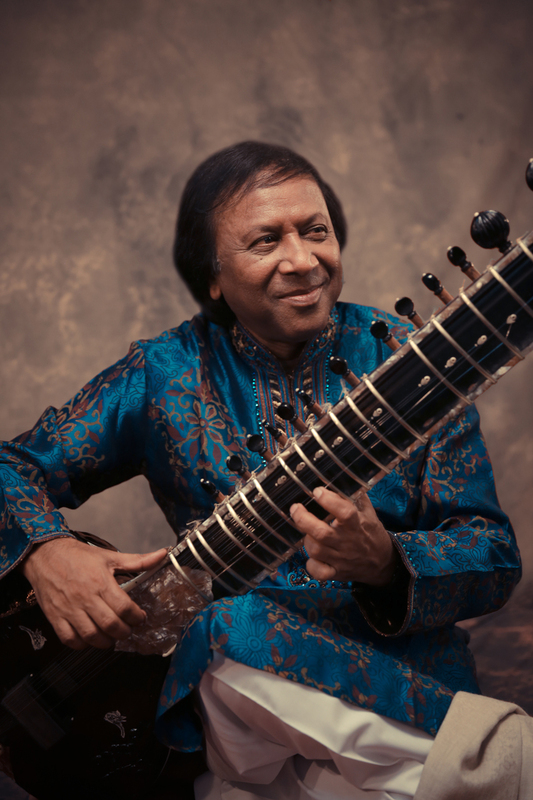 WORLD MUSIC INSTITUTE presents MASTERS OF INDIAN MUSIC | STREETS OF NEW YORK 411 INC.
USTAD SHAHID PARVEZ KHAN – The seventh-generation revered sitar maestro is joined by Hindole Majumdar on tabla. The World Music Institute concludes its acclaimed Masters of Indian Music & Dance series with Ustad Shahid Parvez Khan on Friday, April 10, 2015 at 8:00 p.m. at Symphony Space. Ustad Shahid Parvez Khan is a seventh-generation sitar maestro from the illustrious Etawah Gharana (school), a centuries-old musical dynasty dating back to the moghul courts. He learned his craft from his father, Ustad Aziz Khan, and became a child prodigy, debuting at age eight. Khan is lauded for his technical brilliance and innovative genius and is especially praised for the vocal phrasings of his raga ­improvisations. He has received numerous awards, including the prestigious Sangeet Natak Academy Award, Padma Shri. In addition to being an inspiring performer, he is a dedicated guru. He will be joined by Hindole Majumdar on tabla. The Masters of Indian Music series continues the World Music Institute’s long tradition of presenting the finest in Indian classical music, both Hindustani (North India) and Carnatic (South India). Previous concerts in the 2014-15 series included virtuosic vocalist Kaushiki Chakraborty and the famed dance troupe Nrityagram, both presented in collaboration with the Metropolitan Museum of Art. WMI has been the leading presenter of Indian artists since its founding in 1985; its very first concert featured some of India’s most celebrated classical artists, including Lalgudi Jayraman, Maharajapuram Santhanam, Hariprasad Chaurasia, Shivkumar Sharma, and Zakir Hussain. Ustad Shahid Parvez Khan is privileged with both belonging to an illustrious musical family, and for achieving success in not only preserving the tradition but in pushing its boundaries to even greater heights of aesthetic beauty. He is one of the most brilliant musical gems of the famous Etawah Gharana and belongs to the seventh generation of this musical lineage. His family has produced the most revered and influential figures in Hindusthani Classical Music including the likes of Sahabdad Khansahab, Imdad Khansahab, Enayet Khansahab, Waheed Khansahab and Vilayat Khansahab. A very young Shahid Parvez was initiated into the rich music of the Gharana by his illustrious father and Guru Ustad Aziz Khan, a famous musician and a noted composer and the son of the legendary Sitar and Surbahar virtuoso Ustad Waheed Khansahab. As is the custom, Ustad Aziz Khan first initiated his son into vocal music and tabla, before training him on the Sitar over many years with all the intensity and rigor that had made this Gharana famous. The young Shahid Parvez was recognized as a child prodigy and had started performing in public by the time he was only eight years of age. Dogged perseverance and hard work over the years have been rewarded with an extra-ordinary technical prowess and a mastery over ‘Layakari’. One of the numerous achievements of Ustad Shahid Parvez Khan is to have mastered both Vocal Music and the ‘Tantrakari Baaj’ and then fuse them in such a way as to bring this complex amalgam within the easy reach of all. Few instrumentalists have enjoyed so much of love and admiration as Ustad Shahid Parvez Khan has, from the music loving fraternity worldwide. He is a Top Grade artist of A.I.R. and a recipient of numerous national and international awards including the ‘Sur Shringaar’, the ‘Kumar Gandharva Samman’, the”M.L. Koser Award’, etc. He is also a recipient of the prestigious “Sangeet Natak Academy Award” of 2006. He has performed in all major musical festivals in India and abroad including the Festival of India held in the US, Europe, USSR, Canada, Middle East, Africa and Australia, enthralling the audience everywhere. With numerous LP records, audio and video cassettes, CDs and DVDs, numerous awards and accolades, and a distinguished performance career in India and around the world, he is widely recognized as one of the greatest sitar-players of the world.